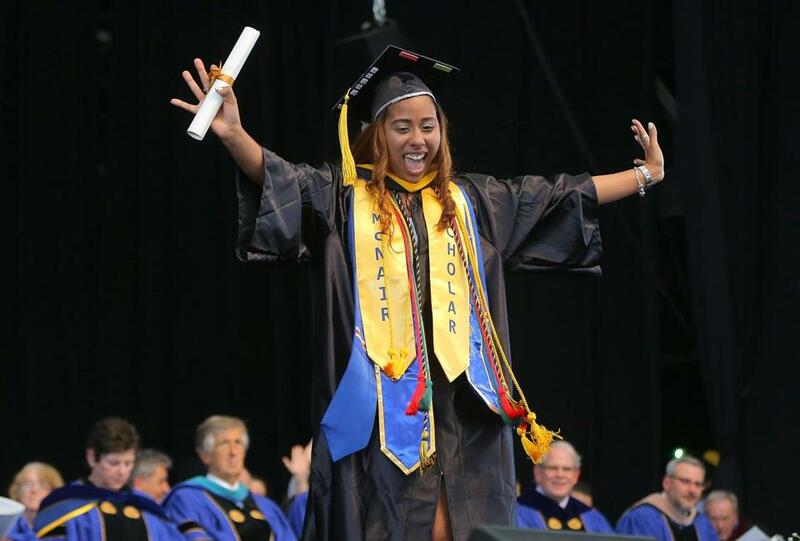 More than 2,000 graduate and undergraduate students from Suffolk University were set to cross the stage Sunday under Blue Hills Bank Pavilion in Boston’s Seaport in three commencements throughout the day. Paul Grogan, president and CEO of the Boston Foundation, addressed a well-dressed crowd in an efficient commencement speech to the Sawyer Business School in the morning. With the speech clocking in at under eight minutes, Grogan urged graduates to consider evaluating their future careers — and the moment of their graduation — in moral terms. “There’s a lot of good news in the world and in particular in the city of Boston,” he said. But Boston is also in a kind of crisis of inequality, said Grogan, who has worked on revitalizing neighborhoods in the city since the 1980s. He pointed to chronic underfunding of public transit and the need for housing. “Don’t let economic success be the extent of your ambition,” he warned. Cara Hoey, 22, from Winthrop, said that’s advice she’s already taken to heart. As a sociology minor, she’s grown more aware of inequality. A diagnosis with Crohn’s Disease as a sophomore and being told she might have to take a leave of absence helped her realize that the starting salary of a job is not so important. “I wanted to give back,” said Hoey, who gets regular treatment to keep her healthy. “I’m really excited to be actually helping people” at Brigham and Women’s Hospital, where she recently accepted a position. Later, at 1:30 Sunday afternoon, undergraduates from the College of Arts and Sciences heard from alumnus Timothy Phillips, founder and CEO of Beyond Conflict, an international peacemaking organization. Phillips, an alumnus of the college who grew up in Brighton, told students he learned the basics of his work promoting democracy and reconciliation in Boston. “Growing up in this city I met people who were afraid, uncertain of change and the unknown,” especially during the busing crisis, he said. And after working around the world, including the Northern Ireland peace process and the transition from Apartheid in South Africa, he said his attention has turned back to his hometown. Sara Ghattas, 23, from Lebanon, who graduated with a global and cultural communications degree, said she was glad Phillips delved into the issue of race in his speech. As an Arab woman, she said she’s experienced discrimination as a college student in the United States. “There is racism in this city,” she said. “It’s not outright,” like the experiences she said she had at a college in North Carolina before transferring to Suffolk. Ghattas said she’s experienced racial harassment in Boston, too, but described Suffolk as a “haven for POC,” or people of color. She hopes to continue working on issues of race and inclusion, as Phillips encouraged the graduates to do. On Sunday evening, the marathon of commencements wrapped up with a graduation of Suffolk law school, headed by a speech from Linda Stewart Dalianis, New Hampshire Supreme Court’s first female associate justice and chief justice. She cracked a few insider legal jokes, and quipped that “kind bartenders, understanding Uber drivers, and late-night pizza deliverers” needed credit for getting the students to this stage. Yet Dalianis also described a profession under attack to the 330 graduates. “But do not ever forget that we are an honorable profession,” she said, warning graduates to always protect their reputation. “You are measured on character...not on whether your client won or lost,” said Dalianis, who retired last month from New Hampshire’s highest court after nearly 20 years. She said it was fitting the address would likely be her last major speech.